AND gate also has two or more input signals same as that of OR gate, and the output is single. The gate has a high output only when all the input signals are high otherwise the output signal is low. The logic symbol for the gate is shown below. The switching circuit of the AND gate is shown below. 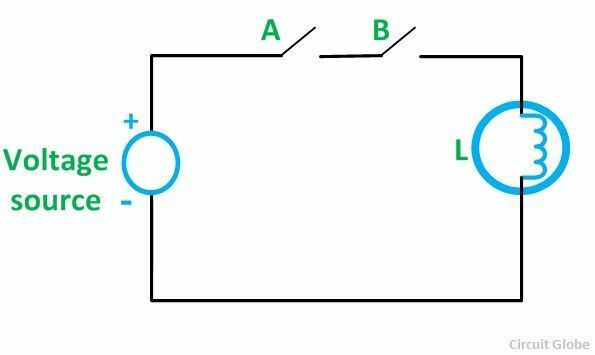 A lamp is connected to a voltage source through the two switches A and B. The lamp will glow when both the switches are closed. If any one of the switches is opened, the lamp will not glow. The truth table of the AND gate is given below.